Kickstart Advice 26: Share your personal story and inspiration for your project. Kickstart Advice 27: Give your pledge levels names for easy reference! Plus it's fun for backers to check them out! Kickstart Advice 28: Search for Facebook groups that may be interested in your project. Try contacting admins and posting pics with links. Kickstart Advice 29: Got a Facebook group about your project? Posts should be relevant/interesting to people who aren't already fans. Aim Viral! Kickstart Advice 30: Skype/"Hang with the director" style pledge rewards are more successful if the person is known and has a following. Kickstart Advice 31: There is a difference between being persistent and spamming people. Kickstart Advice 32: Don't spread yourself too thin. If you can't maintain a Twitter, Facebook page and Youtube channel, focus on what you can. Kickstart Advice 33: A limited pledge level at a discounted rate works as a "Early Bird Special" encouraging people to back early to save. Kickstart Advice 34: Message backers. By thanking them for their support and asking them to share, they will become more active backers. Kickstart Advice 35: After your campaign is successfully funded, don't stop posting updates! Let backers know how the work is going! Kickstart Advice 36: Get pictures to put in your project description. It breaks up long walls of text and catches more eyes easily. Kickstart Advice 37: A retweet from someone with a big following can spike views, but only briefly. Find project friendly twitter profiles and tweet many people. Kickstart Advice 38, from @sawdustbear: Be sure to figure shipping weights for rewards ahead of time or lose funds to UPS. Kickstart Advice 39: Be sure to have engaging audio and visual material in your video. Blank screens with texts don't get people excited. Kickstart Advice 40: Be open and honest with backers when things go wrong. They will be more understanding if you keep them up to date when things get delayed. Kickstart Advice 41: Never just launch your campaign and leave it be. Many great projects fail because the right people didn't know they existed. Kickstart Advice 43: See if you can't find a business to match funds raised to boost your project. Kickstart Advice 44: Most forums delete self promoting message as spam. Work around this by linking to your project in signatures and profiles. Kickstart Advice 45: Shipping internationally can get pricey. You can request international backers to cover the cost. Kickstart Advice 46: People respond well to visual communications so use pictures and videos whenever you can! Kickstart Advice 47: Backers are willing to wait for rewards, so don't rush shipping schedules. If you need to take longer, take longer! 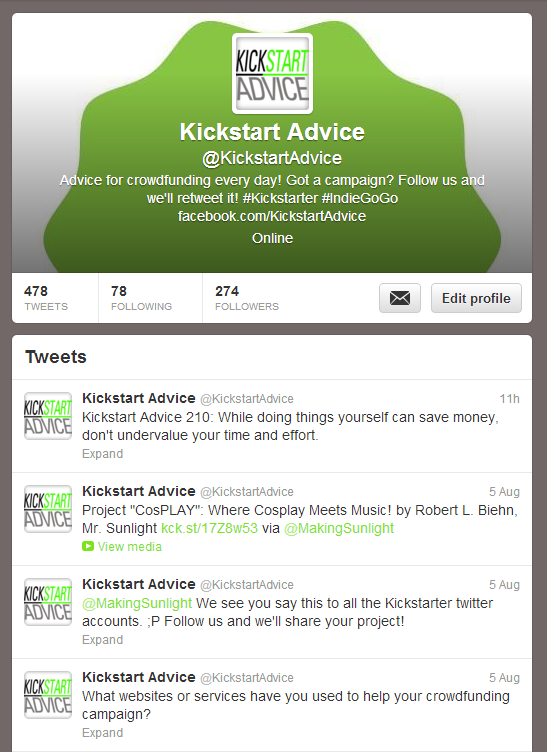 Kickstart Advice 48: Get people involved by having contests for commenting and sharing on posts about your project. Kickstart Advice 49: Talking about your project shouldn't be only one person's job. Get your team involved! Kickstart Advice 50: Offer a variety of pledge levels, from low end to high end! You never know who might be interested in your project!